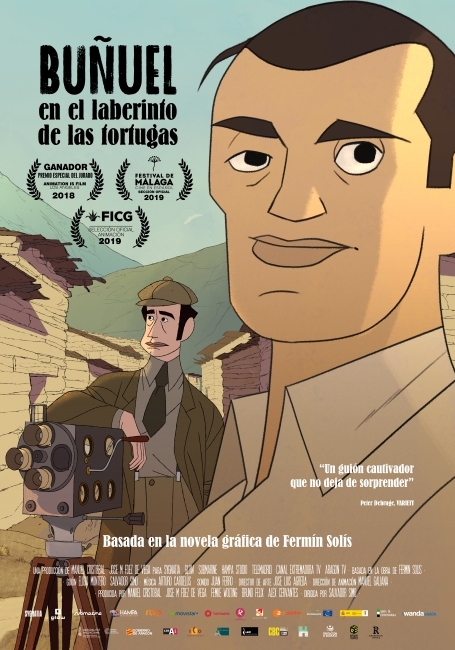 “Buñuel in the Labyrinth of the Turtles” is our first film, self-produced, a 2D animation film directed to the adult public and based on the graphic novel by Fermín Solís. Our studio has participated in all phases of this international co-production, which will be released in 2019, being the main studio for its development and production. 1930th, Paris, the film “The Golden Age” cause a social scandal and Luis Buñuel, thinking he was destined to be the surrealism star, does not find support. Then, he is being offered a documentary project about one of the poorest places in Spain, Las Hurdes, but Buñuel has no financial means to produce it. His friend, the sculptor Ramón Acín, buys a lottery ticket while joking, promising Luis the documentary financing in case he wins it. The ticket is awarded and Ramón fulfills his promise. The harshness of Las Hurdes and the extreme misery of its people, affects Buñuel deeply. Reality, dreams, memories of Salvador Dalí and his own childhood intermingle in his mind, endangering not only the production but also his friendship with Ramón. From then on, the Buñuel of the future is born. But, what does it lose? What is the cost to him?